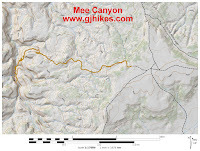 The Mee Canyon trail is located in the Black Ridge Canyons Wilderness Area near Grand Junction, Colorado. 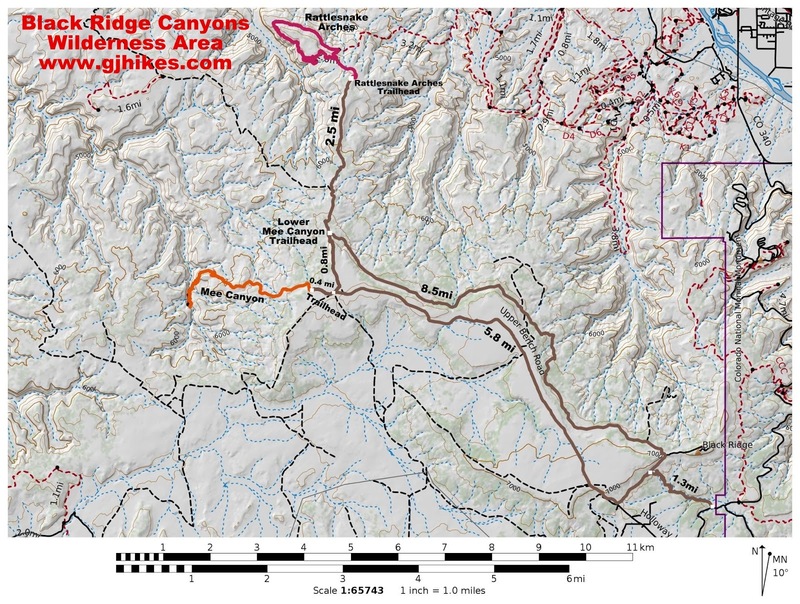 The trail begins on the west side of Black Ridge where it descends for about 1.8 miles to where it drops into a side branch of Mee Canyon. At the drop in point the trail passes through a small arch and down a ladder. Multiple scrambles come up as the trail works its way over one bench after another as it gets deeper into the head of the canyon. At one point hikers must crawl through a small opening at the point of a cliff followed later by a walk along a narrow ledge. The usual destination is to a massive cavern that is roughly 300 feet deep by 200 feet wide and 80 feet high. There are several routes to the trailhead depending on what time of year it is. The Upper Access Road is open to motorized travel from April 15 to August 15. The Lower Access Road is open from August 15 to February 15 and both roads are closed between February 15 and April 15. The easiest directions to the access roads is to find your way to Glade Park and turn at the store onto 16 1/2 Road. Follow 16 1/2 Road north and just before it reaches Rimrock Drive turn left onto the Black Ridge Road. After 1.3 miles the road splits with the Upper Access Road taking the left fork and the lower road taking the right fork. It is another 6 miles along the upper road to the trailhead. If you take the lower road you will have to park at the lower trailhead and hike (or bike) an extra 1.2 miles to get to the upper trailhead. From the trailhead the route passes through a gate and follows an old double track that makes a gradual descent toward Mee Canyon. Distant views of Mee Canyon snaking its way toward the Colorado River can be seen from several vantage points. From one spot you can see the Rattlesnake Arches area (not in this photo) although it is difficult to make out any arches from this distance. 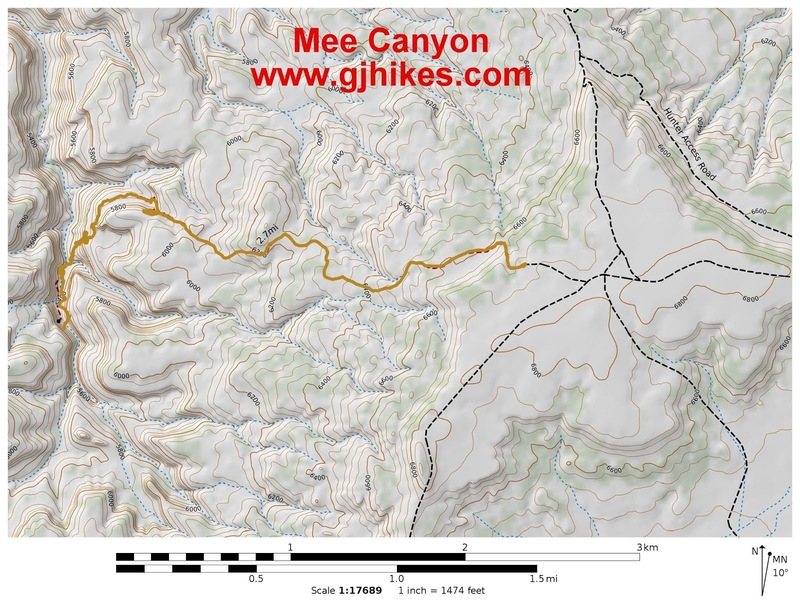 The double track transitions to a single track that continues a gradual descent and near the 1.8 mile point reaches the rim of a side branch of Mee Canyon. The fun begins as the trail starts working its way into the canyon. Getting down the first bench is made easier by a tree that is hugging the rock. It has a crook in its trunk that makes for a perfect place to place your foot. The next maneuver involves slipping through a small arch where a ladder awaits to get you down to the next level. The ladder has come loose from the cliff on one side but it isn't really a big deal. Once you sit down and begin transferring your weight to it you can tell how to best distribute yourself for the short climb down. There was a sign at the trailhead warning about the ladders instability. We figured the BLM was doing their 'do diligence' to warn hikers. At the bottom of the ladder the trail continues dropping until it reaches a slickrock bowl that it descends. From there the going gets easy as the trail begins wrapping around a small bench toward the upper part of the main canyon. The next interesting feature comes up at the point of a cliff where there is a little exposure. At first it looks almost impassible until you realize that the trail makes a short climb up some ledges where it finds a hole in the top of the cliff to pass through. If you have a big pack or lots of camera gear like we did you might have to take it off to make things easier. TIP: On the return trip it is much easier to go through the hole feet first. 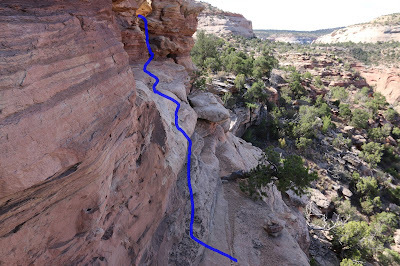 At one point the trail crawls over a boulder that outcrops from the cliff and ends up on uneven sandstone. This is where the trails most famous feature, 'the ledge', comes up. The ledge is 15-20 feet long with about 20 feet of exposure on the canyon side. That is, if you fell off of the ledge you would land on the next level that is about 20 feet lower. The nice thing about the ledge is that the high wall slopes slightly inward. The unnice thing is that there is uneven slickrock getting onto the ledge and at the other end the ledge gives way to a short drop that makes it awkward to get off of the ledge going down and to get back onto the ledge climbing out. After the ledge the trail has a few more benches to drop over until it eventually ends up in the canyon wash. From there it is is a little less than a half mile heading up the canyon to the massive cavern that is usually the ultimate destination for Mee Canyon. There is a large rock fall in the middle of the cavern but even with that the thing is huge inside. The rock fall should serve as a clue not to set up camp on the inside. There is a spot near the opening that you can see in the photo before this one that is high enough above the wash and far enough from the rubble pile that it should make a much safer campsite. For the trip out of the canyon you get to deal with everything in reverse. Some of the things that seemed a little iffy on the descent might appear more trivial on the climb out. On the climb out we removed all of our camera gear and packs when we got to the ledge and used a rope to haul them up to the next level. That gave us more room and made it easier to get back on the ledge from the bottom. The BLM map at the trailhead shows a distance of 2.1 miles for the trail. We figure that is about how far it was to the bench below the slickrock bowl and from there it is about another mile to the cavern. 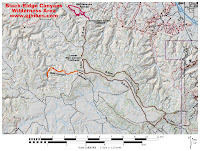 It is our opinion that anyone planning to make this hike all the way to the canyon wash should either be an advanced level backcountry hiker or be in the company of someone that is. This is a wilderness area so if you need rescued they won't be sending a helicopter in to get you. Hopefully you will be prepared and have a big ole smile on your face like Tom did for the entire time. If you would like to see it for yourself then all you have to do is 'Take a hike'.